Use an electric mixer to combine the mustard, honey, mayonnaise, and lemon juice in a small bowl. Blend the mixture for about 30 seconds with a fork or whisk. Place the halved chicken breasts in a gallon sized plastic bag and pour in about a third of the marinade. Seal the bag, squeeze out the air, marinate in the refrigerator for about 2 hours. After the chicken has marinated, remove chicken from bag and discard the marinade. Preheat the oven to 375 degrees and heat a cast-iron frying pan large enough to hold all four breasts and 1 tablespoon of oil over medium heat. (If you don’t have a cast-iron frying pan, transfer the chicken to a baking dish). Sear the chicken in the pan for 3-4 minutes per side or until golden brown. Remove pan from heat but keep chicken in the pan. As the chicken is cooking, in a small frying pan saute the mushrooms in the butter. Brush each seared chicken breast with a little of the honey mustard marinade being sure to save a little extra that you can serve on the side later with the dish. Season the chicken with salt, pepper and paprika ( I am usually pretty generous with the paprika, I love the flavor). Stack two pieces of cooked bacon, crosswise on each chicken breast. Spoon the sauteed mushrooms onto the bacon, being sure to coat each breast evenly. Sprinkle 1/4 cup Monterey Jack cheese evenly onto each breast followed by 1/4 cup of cheddar. 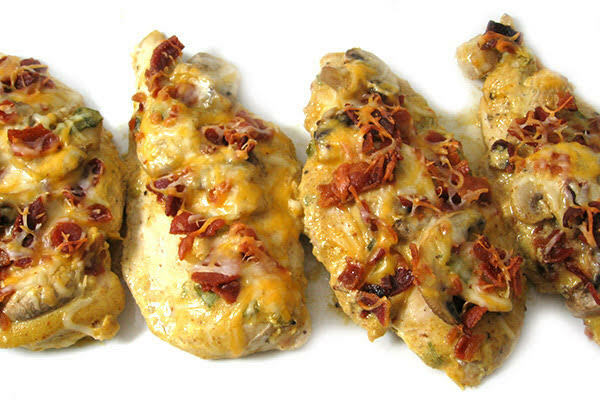 Bake the pan of prepared chicken breasts for 7-10 minutes or until cheese is thoroughly melted and starting to bubble. Sprinkle each breast with 1/2 teaspoon parsley before serving. Put extra honey mustard marinade into a small bowl to serve on the side. Looking to have some great Outback Steakhouse food, but don’t want to cook it yourself? We have found a site with some great Outback coupons that will at least help you save some money on your meal. Here is a great hash recipe for those of you that are watching your carbs. We will occasionally add low carb recipes on this site, but if you are on a low carb diet and looking for more recipes than we recommend checking out the low carb recipes on Low Carb Go. ½ bouillon cube (dissolve in a 1/2 cup of water). Chop the left over beef, the 3 turnips and the small onion. Set aside for now. Place chopped bacon strips in non-stick pan or cast iron skillet and begin to fry on high heat. Add about half of the bouillon when the bacon is half cooked. Then toss in the turnips and stir until they begin to brown. Add diced beef and onion last and saute until it gets brown and crispy. When hash is nearly done, drop the heat to about medium and add the other half of the bouillon. Simmer stirring often until most of the bouillon juice is gone. Make sure everything is cooked and warm. Then sprinkle with coarse black pepper and serve at once. I also like to add over easy eggs on top of my hash! In a small bowl, mix flour, salt and pepper. With a meat tenderizer, pound mixture into meat on both sides. Cut into serving pieces. Set up three shallow pans for dipping and coating. (1) Place leftover flour mixture in first pan. (2) Place egg/liquid mixture in second pan. (3) Place breadcrumbs in third pan. Proceed with preparation of meat! Heat oil in a heavy skillet over medium-high heat. Add meat to hot oil and brown quickly on both sides. Cover and reduce heat to medium and cook for 15 to 20 minutes, turning occasionally. County-fried steak should be well done, but not dry. Remove steaks from pan and drain onto paper towels. Keep warm! Using a wire whisk, stir flour into meat drippings to make a roux, smooth paste. Add milk and heat to boiling, whisking constantly. Reduce heat to medium and whisk until thickened. Serve over meat! 13 x 9 x 2-inch baking pan with cooking spray. Lay coated breast halves in a single layer. Bake for 50 to 55 minutes or until juices run clear. Preheat oven to 350-degrees. Beat butter and sugar until creamy. Beat in egg and molasses. In another bowl stir together all dry ingredients. Add dry ingredients to creamed ingredients and mix well. Place small hand rolled cookies onto a cookie sheet coated with cooking spray. Sprinkle sugar over and flatten with bottom of water glass. Bake in a preheated 350-degree oven for about 12-15 minutes or until light brown. Preheat oven to 350-degrees. Peel, cook and slice potatoes ¼-inch thick. Layer in a 13 x 9 x 2-inch baking pan coated with cooking spray. In a saucepan, make a roux of the butter and flour. Gradually stir in milk and seasoning. Continue stirring over medium heat until thickened. Remove from heat and stir in cheeses. Pour cheese mixture over potatoes and sprinkle with bread crumbs. Bake uncovered for 25 to 30 minutes or until heated through. In a large container, combine the cucumbers, onions and salt. Cover with crushed ice and mix. Let stand for 3 hours. Drain, rinse with cold water and drain again. Combine sugar, vinegar and seasonings and bring to a boil in a large kettle. Add cucumber mixture and return to a boil. Ladle hot mixture into hot jars, leaving ¼ inch headspace. Adjust caps. Process for 15 minutes in a boiling-water bath. Remove jars to a wire rack to cool completely. Rinse chicken breasts under cold running water and pat dry with paper towels. Pound and flatten between two layers of plastic wrap. Lightly salt and pepper to taste. Dip chicken in beaten eggs and dredge in bread crumbs. Repeat! In a large skillet, heat oil to medium-high. Add chicken, turning and browning for 10 to 15 minutes or until juices run clear. Add spaghetti sauce and cook for 30 minutes over medium-low heat. Uncover and sprinkle cheeses over. Serve with a side of whole wheat spaghetti.